England’s 4 leading batsmen – Charlotte Edwards, Heather Knight, Sarah Taylor and Lydia Greenway – have collectively been dismissed over 500 times in limited overs internationals*. We take a look at the numbers showing how they got out. With the usual caveats about lies, damned lies and statistics, what does this tell us? Collectively, the most common mode of dismissal is Caught. This is the case throughout all international cricket, men’s and women’s – though the men tend to be caught behind rather more often than the women. For individual players, the statistically significant numbers (see An Aside on Statistical Significance below) are highlighted in RED. Sarah Taylor tends to get caught rather more than her peers. She likes to go over the infield, with lofted drives particularly over mid on. It is a tactic which has brought her enormous success, but it isn’t without its risks if she doesn’t actually clear the fielder. Lydia Greenway gets Run Out a lot. Is this because, batting a bit further down the order, England are more likely to be under pressure and chasing every run when she comes to the crease; and so Lydia finds herself taking more risks than her peers? Or perhaps it’s because she finds herself batting more often with all-rounders and tail-enders? Either way, it’s a particular concern this summer given that the fielding of the Aussies is top-notch, and won’t leave much room for confusion between the wickets. Statistical significance is a complex science, but Heather’s dismissals are actually an interesting case here, helping to explain it in simple terms. As we’ve seen, 16% of her dismissals are Run Out – shown in PURPLE above. This looks like a lot compared with the average of 12%, but actually she has only been Run Out 8 times. Had she been run out just 2 times fewer, her percentage would fall right down to 12% – i.e. the average for the group. So her 16% Run Outs are not considered statistically significant. In the immortal words of the Aussie soap theme, “Everybody needs good neighbours!” But in sport (as in Ramsay Street) it is often the BAD neighbours that make the biggest stories – think the Mets v the Yankees in Major League Baseball; Carlton v Collingwood in Aussie Rules; or Celtic v Rangers in Scottish football. And women’s cricket is no exception – Kent and Sussex are neighbours… but GOOD neighbours? Hardly! So if Sussex were to be contemplating a franchise bid, it is a pretty safe bet that it won’t be a joint bid with Kent! Ditto Middlesex and Surrey; not to mention that oldest and fiercest of great cricketing rivalries, Lancashire and Yorkshire. Yet with only 6 franchises to share around in the proposed Women’s Cricket Super League, this could well be a major sticking-point. The counties listed above are probably six of the most likely franchise candidates, especially when you factor-in financial viability; but it would mean 4 of the 6 franchises within 60 miles of London, and the other two based either side of the Pennines – leaving huge swathes of the country, from the Midlands to the south west, without a sniff of top-level women’s cricket. And this DOES matter – perhaps not commercially, but certainly from the perspective of building England’s next generation around localised “Centres of Excellence” for coaching and development. Is there a way to cut through this? It won’t be easy. * Or possibly Beckenham… but that doesn’t buck the point! Sunday saw two Lincs v Norfolk games, with the ladies’ teams and U15 teams both facing each other. The Mini Imps set the visitors a target of 147, with prominent bat Ellie Stanley gaining 78 of Lincolnshire’s runs. The strength of the U15 bowling attack shone through as Norfolk were bowled out for 50 inside 22 overs. The Mini Imps were fortunate as three of the regular Norfolk U15 players had been called up to the ladies squad to face the Lincs Ladies. Imps captain, Hayley Butts, lost the toss and the hosts were put into field with only 10 players present. With one less player on the field the Imps needed to bowl and field tightly to restrict a strong Norfolk bating team. They did just that. At drinks the Imps had managed to get Norfolk 80-4, a score board which pleased Lincs coach/ manager Alan Ward, and showed promise for the rest of the game if the Imps could continue to be as tight in the field. For this to be plausible the Imps needed to get rid of opening bat, Tirimanna, which was skilfully done shortly after drinks when India Freeman got her stumped off Amy Halloran. Norfolk ended up all out for 182 with wickets coming for Rachael Dyer (3-38), Becki Brooker (2-24), Beth Smith (2-28), Sarah McDowell (2-27) and Amy Halloran (1-36). Lincs began not worrying too much about the run rate, just looking to keep wickets in hand. Unfortunately Smith (17) was run-out early on, and McDowell (8) got caught out to a ball that popped widely off the pitch shortly afterwards. India Freeman and Halloran looked to steady the ship and were in the process of building a partnership when Freeman (27) attempted to go over the top and got caught leaving Lincs 73-3. Halloran (13) fell caught behind 8 runs later, and Butts and Brooker added a small partnership of 19 before a direct hit from Hemp dismissed Brooker (13) and left the Imps 102-5. Wickets fell steadily after that with Butts, Dyer, Coggan, debutant Knapton and Barnes all failing to reach double figures. The extras score kept the Imps total ticking over but it was a landslide away from what they needed, and they were eventually all out for 126. The pick of Norfolk’s bowling and fielding came from Hogg (3-9), Reay (2-8), Cornelius (2-29), and Hemp (1-23), who also ran out Smith and Brooker. So ended a glorious day for the Mini imps, but a disappointing one for the ladies, who for the team to succeed need one of their top 6 to achieve a big score, like the one that Tirimanna got for the travelling team. The Imps have two months to learn from the game before their next county champs fixture; in the meantime, they head to Ellesmere in a fortnight, where they will open their T20 campaign after last week’s scheduled game ended in a washout. Gloucestershire maintained their winning record in the county championship this weekend, with a hard-fought 36-run win against Shropshire at Bridgnorth CC. After winning the toss and batting, openers Abby Evans and Charlie Walker built a large opening stand based on positive strokeplay and determination to lead from the front. Both were quick to despatch anything loose and their stand of 92 provided a great platform for the rest of the innings. Abby reached 50 from 64 balls with 6 boundaries before she was bowled by Lara Jones. With the score on 108 Charlie was given out LBW sweeping for a measured 36 from 66 balls. Gloucestershire then lost two quick wickets before Bethan Moorcraft and Eve Alder produced a positive partnership to give the innings impetus. Bethan played with a clear purpose, ran positively and hit 7 boundaries in her innings of 50 from 62 balls. 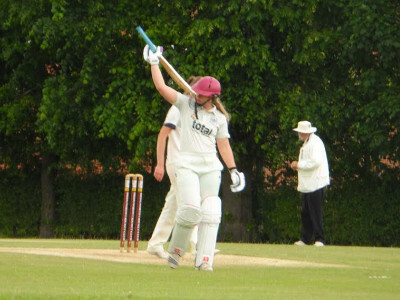 Eve played a valuable supporting role and the pair put on 55 in 13 overs before Eve was run out for 17 and, shortly after reaching her 50, Bethan was bowled, with the score on 174. However, Laura Marshall (10*), Danika Dyer and Chloe Davis ensured that the score passed 200, and Gloucestershire finished on 205 – 9 from their 50 overs. Things didn’t go to plan for Gloucestershire once Shropshire’s innings got underway, as Robyn Mathews played very positively right from the start. She shared in partnerships of 41 with Lara Jones and 62 with Millie Home to give Shropshire a real chance of chasing down their target. The introduction of Danika Dyer brought about the change Gloucestershire were after, and she took the wickets of Jones and Home, both LBW. Her mid-innings spell of 2 – 22 from 10 overs was crucial. While Mathews carried on, passing 50, Dyer and Mollie Robbins started to turn the screw with some tight bowling. The game looked to be heading for a tight finish with 8 overs to go and Shropshire wanting 51 with 6 wickets left, but a brilliant stumping by Laura Marshall off Mollie Robbins dismissed Mathews for a superb 80 and from that point onwards Gloucestershire dominated. 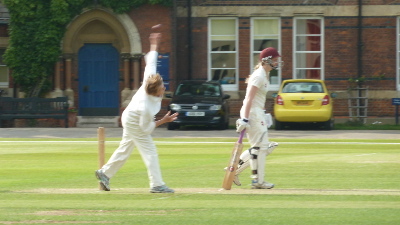 Robbins picked up two further wickets to finish with 3 – 27 from her 10 overs. A late wicket from Sidra Khan put the seal on the victory as Shropshire ended their 50 overs on 169 – 8. Gloucestershire are next in action in the County T20 competition against Buckinghamshire and Oxfordshire on 5th July. Yorkshire’s tight bowling and aggressive batting at Harrogate CC put an end to Middlesex’s unbeaten run this season, as the Meatballs suffered a 9-wicket defeat. Yorkshire won the toss and, in overcast conditions, it was a good one to win. There was rain around, but it was good to see no overs were lost. Middlesex were once again without Cath Dalton, who remains injured after hurting her ankle on the eve of the T20s last weekend. Sophia Dunkley and Natasha Miles opened for the visitors, but there was no repeat of last week’s heroics. With Katherine Brunt and Laura Spragg opening the bowling, Spragg took the first wicket in the 4th over as Dunkley was bowled for 7, unable to add many to her unbeaten tally of 91 runs from the previous two games. Spragg and Brunt bowled six and seven overs respectively in their opening spells, with Brunt’s penultimate over being a wicket-maiden which saw the end of Tash Miles for l4. Fran Wilson, who was in good form following her 55 in the recent EWA game against Loughborough MCCU, played fluently, sharing a partnership of 29 with Beth Morgan. Morgan also shared a solid stand of 39 runs with Izzy Westbury (33). But wickets fell regularly, with Katie Levick (3-21) and Brunt (3-23) finishing with three wickets apiece, and Middlesex were all out for 176 after 40 overs – 10 short of the allotted number. On a good deck, this was some way short of a competitive total. If Middlesex were to even entertain an away win they had to take early wickets. Danni Warren and Ria Raval opened the attack against the threatening right-hand/left-hand combination of Winfield and wicketkeeper Beth Mooney. After 10 overs Yorkshire were a sound 46-0, and Westbury was ringing the bowling changes in an attempt to find that elusive wicket. Yorkshire gave no chances as both Winfield and Mooney reached half-centuries. They found the boundary with ease, including one six from Mooney, and continued to attack the bowling as they closed in on their target of 177. This resulted in the one positive for Middlesex from the innings: Alex Hartley’s dismissal of Mooney for 69, as she tried to secure another boundary but was caught on the fence by Anna Nicholls. Winfield continued her fine form as she finished on 99 not out, having been unable to hit the required six to reach her century. This saw Yorkshire to a convincing 9-wicket win after just 30.4 overs. However, she stressed that “winning games for Yorkshire is very much what is important for me right now”. From Middlesex’s perspective, it was a disappointing loss, made worse by the fact that Ria Raval had to leave the field after tearing her hamstring as she leaped for the ball. She is expected to be out for several weeks. Both Kent and Sussex continued winning streaks this weekend in the fifth round of Championship matches, with comprehensive wins over Warwickshire and Nottinghamshire respectively. Yorkshire also had a great weekend, beating Middlesex by 9 wickets and securing maximum bonus points, ending Middlesex’s unbeaten record this season. It means that Kent now sit top of division 1 with an average of 16.4, with Yorkshire catapaulting themselves into 2nd place with an average of 14. For Surrey, who beat Lancashire by 6 wickets, the star was Sarah Clarke, who took 4-11 to become Surrey’s all-time leading wicket-taker in the county championship (with 123 wickets to her name). Meanwhile in Division 2, Staffordshire (with an average of 17.5) and Somerset (17.33) are well out in front, following victories yesterday against Wales and Essex respectively. The next round of Championship matches will take place on 19th July, when all counties will be without their England players (who will be preparing for the start of the Ashes two days later). It will be interesting to see how they fare. Warwickshire / Kent – Tammy Beaumont continued her excellent domestic form this season as she top-scored for Kent with 67, with her team eventually finishing on 209-8, the highest total of the weekend. Warwickshire then collapsed for 125 all out, as Megan Belt (3-20), Tash Farrant (3-23) and Laura Marsh (2-33) shared the wickets between them. Lancashire / Surrey – Putting Lancashire in to bat proved to be a good decision by Surrey as Nat Sciver (5-27) and Sarah Clarke (4-11) wreaked havoc, bowling Lancs out for 78. Sciver (28) in conjunction with Susie Rowe (35) then took Surrey to a 6-wicket victory. Sussex / Nottinghamshire – Holly Colvin’s 4-20, her best figures since returning to competitive cricket, saw Notts bowled out for 132 in 36 overs, with Jenny Gunn’s 39 their top score. Sussex easily chased down the runs in just 28.3 overs with Sarah Taylor (39) ably assisted by Georgia Elwiss (27) and Paige Scholfield (25). Full report here. Yorkshire / Middlesex – Middlesex lost both openers early and despite a fightback by the middle-order, including 45 from Fran Wilson, they were bowled out in the 40th over for 176. 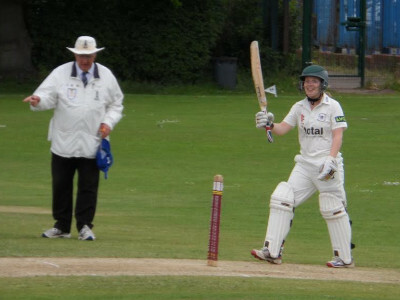 Yorkshire then raced to the required total for the loss of only 1 wicket, with Lauren Winfield finishing on 99 not out! Full report by Georgia Isaac here. Wales / Staffordshire – Lauren Parfitt (30), Gabby Basketter (28) and Naomi Davies (25) took Wales to a respectable 173-8 in their 50 overs, but Staffordshire chased down the target with 8 balls to spare thanks to an unbeaten 47* from Aussie Molly Strano. 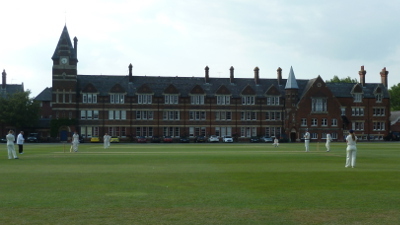 Devon / Ireland – In a tight match, Ireland eventually emerged the winners by 7 runs. Batting first, Ireland had put 165 on the board, the highlight being an unbeaten half-century from Kim Garth. Devon began with a 66-run opening partnership between Amara Carr (33) and Aylish Cranstone (22), but after Laura Delany removed both openers they struggled to find runs. After a series of run outs, a direct hit from Robyn Lewis to run out Devon number 11 Lydia Clements saw them bowled out for 158 in the penultimate over. Durham / Worcestershire – This proved to be the closest match of the weekend, as Durham finished up the eventual winners by just 2 runs. Worcestershire had bowled Durham out for 133 in 37.4 overs – Catherine Chapman top-scored with 31 – but then themselves struggled with the bat. At 89-8, it looked to be all over, but a late 44 from number 6 batsman Lauren Rowles took them to within touching distance of victory. However, she was eventually caught behind with Worcestershire still 3 runs short, and they were subsequently all out for 131. Essex / Somerset – Somerset won by 29 runs despite having been bowled out for 101, including a remarkable 3-6 across 10 overs by Hannah Jeffrey. But Essex also batted poorly, with only Cordelia Griffith (22) making it to double figures, and were themselves all out for a mere 72 in 34.4 overs.